'Omar The Extreme' Accuses Trump Of Extremism - Isn't She A Peach? ‘Omar The Extreme’ Accuses Trump Of Extremism – Isn’t She A Peach? Pick a fight and then pretend she’s a victim. She fits right in with the Liberals, doesn’t she? Now that Omar is taking heat for her statements, she’s gone on offense. You know the statements we mean, right? About 9/11? 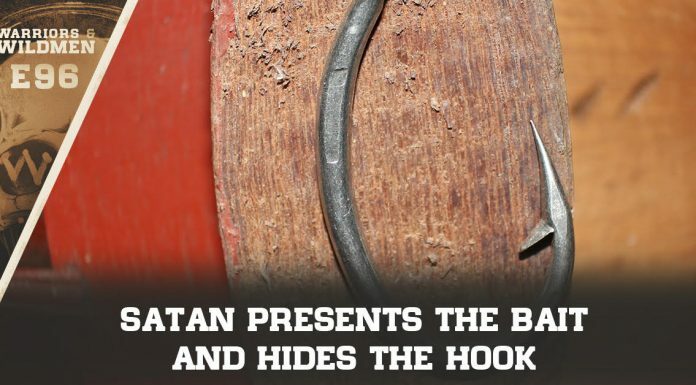 If you’re not up to speed on the context, we covered it here. What most people miss in their reporting is that Omar lied about CAIR to ennoble it as the protector of Muslims unfairly oppressed in the backlash against 9/11. (CAIR was established in 1994.) 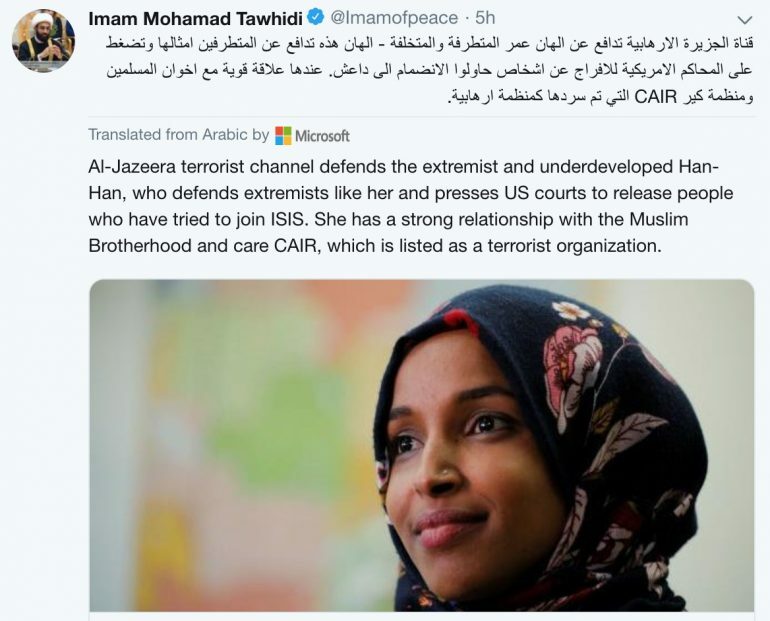 She also failed to mention that CAIR was an ‘unindicted co-conspirator‘ in providing support to the terror group Hamas, according to the FBI. But then, this is Ilhan Omar that we’re speaking of — did you expect better from a woman who may have committed immigration and student loan fraud by marrying her brother? Despite all of her platitudes that she’s “learned” from her mistakes, she keeps making the same one. Rep. Omar is now claiming that this tweet with this video of the 9/11 attack is causing “right-wing extremists” to threaten her life. Since the President’s tweet Friday evening, I have experienced an increase in direct threats on my life — many directly referencing or replying to the President’s video. I thank the Capitol Police, the FBI, the House Sergeant at Arms, and the Speaker of the House for their attention to these threats. Violent crimes and other acts of hate by right-wing extremists and white nationalists are on the rise in this country and around the world. We can no longer ignore that they are being encouraged by the occupant of the highest office in the land. Counties that hosted a 2016 Trump rally saw a 226 percent increase in hate crimes in the months following a rally. And assaults increase when cities host Trump rallies. This is particularly concerning given the president’s visit to my home state of Minnesota on Monday. Pretty rich that Rep. Omar is suddenly condemning “hate speech” and “violent rhetoric” when President Trump did neither. I wonder what Rep. Omar had to say about the Bernie Bro. who shot at the GOP baseball team. I’m sure she condemned that completely and insisted that our “do or die” rhetoric on healthcare change, right? Interestingly, she doesn’t hold the same standard for ISIS recruits. In 2016, she called for leniency and compassion in the sentencing of nine men accused of attempting to join ISIS. In 2017, when she was in the Minnesota House of Representatives, she was one of two members of Congress to vote “no” on a bill that would block life insurance payouts to families of terrorists. Just a few days ago, she was making a public appeal for the President to intervene on behalf of a senior member of the Egyptian Muslim Brotherhood who Rep. Omar calls a “political prisoner” in Egypt. In addition, the original Washington Post article wrote that it was an increase in “reported hate crimes” not that there were actual charges associated with those alleged “hate crimes.” Also, was Jussie Smollett’s Subway excursion included in that tally? Who knows. It’s never ok to suggest, (let alone use,) violence as an answer to political opponents. You know what else isn’t ok? Playing the victim. Since 2016, there have been many on the right that have been actual victims of violence at the hands of leftists and the same ones wringing their hands because they’re getting threatened have said nada to condemn it. Sorry if I don’t feel too much sympathy. But you know what the very best way to “punch back” is? Re-elect President Trump in 2020. Our Big Dawg, and Resident Artist, Doug Giles has struck again. This painting is busting out a new slogan. 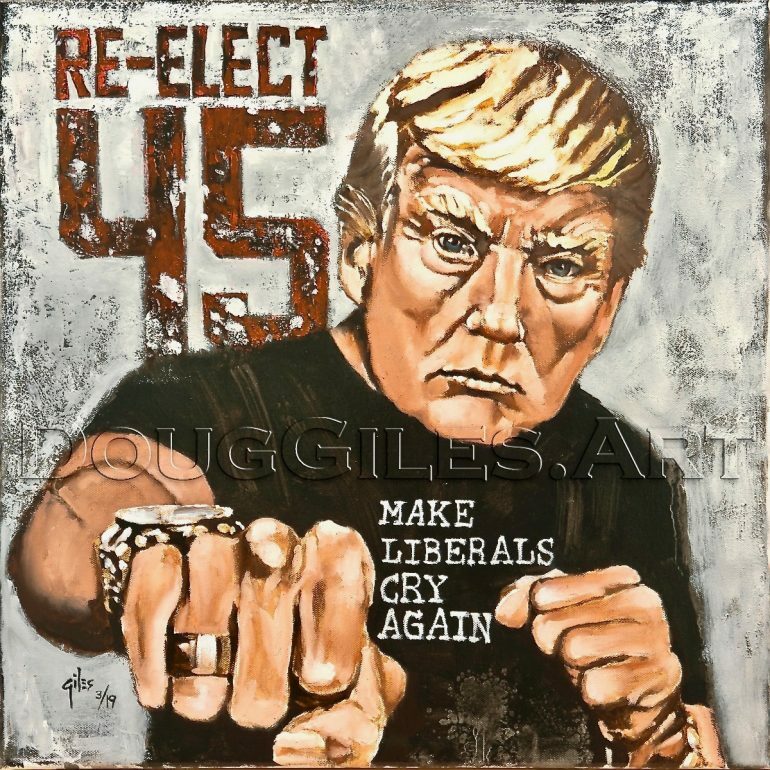 “Make Liberals Cry Again“. After seeing what happened in 2016, it seems like yet another good reason (among so many others) to re-elect him. And although the original is already sold, there are prints available at several price points.